Over 20 years ago, conjoined twins Carmen and Rosa Taveras were brought to Morgan Stanley Children’s Hospital NewYork-Presbyterian to be separated in a groundbreaking surgery. The twins were separated by a team of 52 doctors, nurses, respiratory therapists, technicians, and others in a 14-hour operation that involved rerouting and dividing the internal organs and reconstructing the girls’ severely malformed pelvis and hips. Both Carmen and Rosa grew up to be healthy young adults, but because of the complexity of the separation procedure, it was uncertain if the pair would ever be able to have children of their own. In late November 2013, however, Rosa became only the fourth conjoined twin in history to give birth after separation. 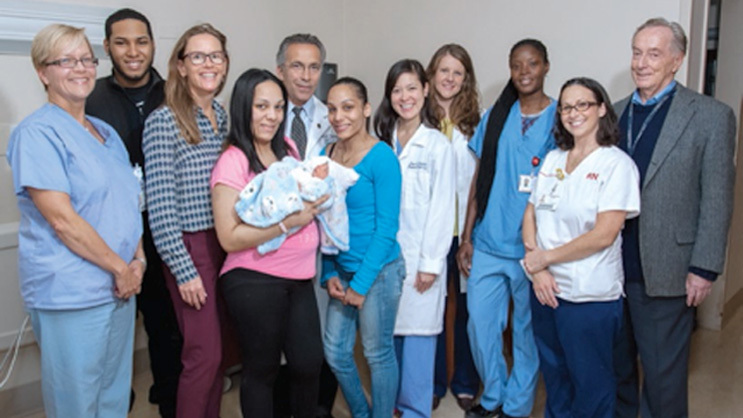 Elijah, Rosa’s baby, was delivered via cesarean section by Kirsten Cleary, MD, Director of Antepartum Service & Perinatal Network Hospitals, NewYork-Presbyterian/Columbia University Medical Center. Making the moment even more special, Steven Stylianos, MD, Surgeon-in-Chief, Morgan Stanley Children’s Hospital, was one of the leading surgeons who oversaw Carmen and Rosa’s separation surgery in 1993, and was present for Elijah’s birth. Both Elijah and Rosa are healthy, and Rosa plans to go back to school to study criminal justice, while Carmen plans to study nursing. This story was originally published in the January 2014 issue of NY Press.